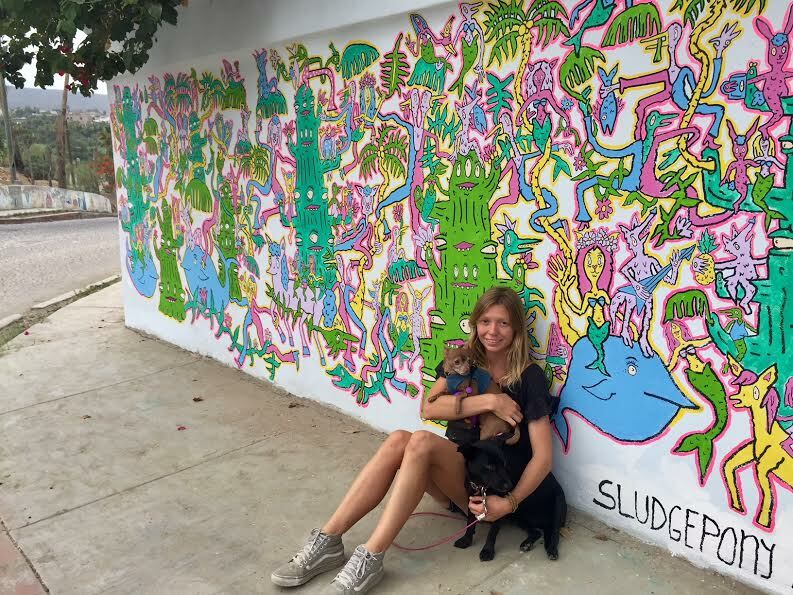 SLUDGEPONY, aka Charlotte Hacker-Mullen, is a visual artist from rural South Carolina who has made her way across the USA and enjoys working most in Todos Santos, Mexico. Sludgepony's work focuses on interconnectivity amongst humans, animals, and the environment. She loves incorporating vibrant colors and silly, seedy characters intp her paintings. The work aims to reminds us, in a light hearted way, that we are all reliant on and affected by one another. Sludgepony enjoys creating something seemingly complex through repetition and aims to capture the sensation of being simultaneously repulsed by and attracted to an image or scene. Sludgepony is inspired by abstract expressionism, automatism,cartoons, and the contrast between quiet country life and the griminess and constant stimulation of city life.